These smaller growing Cymbidiums are remarkably easy care, although given that one of the parents is Cymbidium pumilum syn. Cymbidium floribundum. And it is from this species we get the wonderful cascading orchids that grow so well in hanging baskets as well as in containers. These orchids are not new on the scene, with most of the hybrids being developed in the 1970s. However they are difficult to find as for many years, bigger was regarded as better by many growers. Today these wonderful cascading and miniature cymbidiums come in a range of colours, with Sarah Jean with its white flowers is perhaps being the best known. Sarah Jean ‘Helen’ is a salmon pink to red, however a range of Yellow, White, Red and Pink cascading cymbidiums are available..
Like most Cymbidiums these cascading types are easy to grow. One of the original parent plants, Cymbidium floribundum is said to be quite dry tolerant. They are epiphytic, so grow well in hanging baskets and pots as long a free draining potting mis is used. Watering and fertilising is the same as for their larger cousins. Use a specialist Cymbidium potting mix. Plant is a hanging basket or a pot, both will work. Grow in good filtered light. Water well during active growth, this is generally from spring through summer. In winter, cut back on watering. Do not allow the growing medium to become soggy. During active growth fertilise with specialist orchid fertiliser such as Bloom Master. We use a diluted (50%) solution, rather than full strength. This can be purely because the plant has been newly planted. They sometimes take a year or two to settle in. Over watering can also cause root problems. A lack of fertiliser can be an issue, however not in most circumstances. 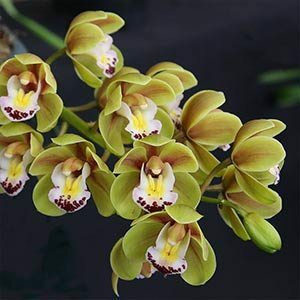 Cascading Cymbidium Orchids are available for sale from the following nurseries.